I so thoroughly enjoyed Fantome’s Saison and their seasonal Printemps, so I had to give some of their other beers a try. 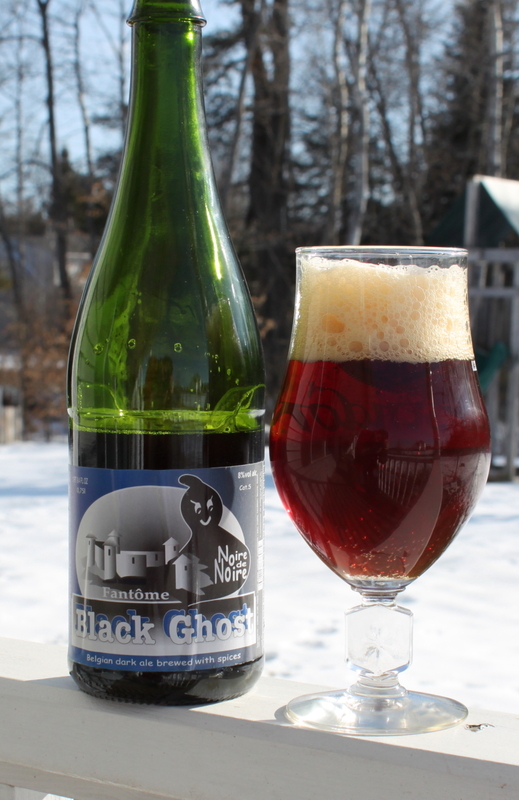 I found a bottle of Black Ghost, and having never having a dark saison before, thought this would be a fun beer to sample. Tasting: The color is a dark brown with red highlights when held up to light. Looks like a dubbel. The head falls quickly. The nose has toasty malt, and a touch of roast, but pretty restrained. There is a spiciness (cinnamon?) and pepper on the background, not sure if yeast or hops, you can tell it is there but subdued. There is also a mustiness, like wet wood, on the back. As it warms up, I get more dark fruit flavors from darker crystal malts or possibly darker Candi sugars. The taste has a crisp bite at first, some of it from the carbonation. There is a dryness to the beer, but that maybe the yeast or the spices, I can’t tell. You can get a touch of fruit from it, more darker fruit flavors, particularly as it warms. It is a bit astringent, some roast comes through at the end, and it ends fairly dry. There is a touch of sourness at the end but very restrained. Critique: Not my favorite from Fantome. I think their Saison is one of the best beers I have ever had, but this just does not do as much for me. I think it is too bitter and dry for the roasted flavors, a bit sharp. I would either like more malt to balance this, or less roastiness. I am glad I tried it, but I doubt I will go out of my way to get this again.